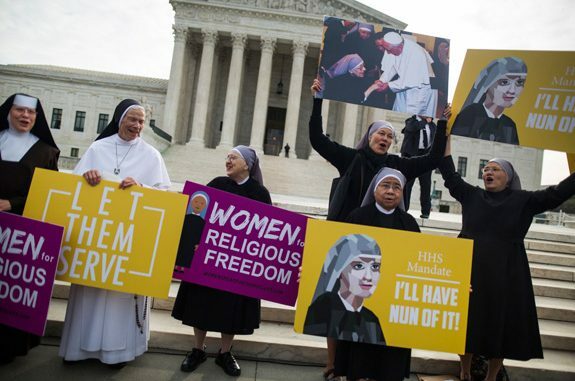 Supreme Court Avoids the Issue, Little Sisters Get a Win. Now what? Earlier this week, the U.S. Supreme Court remanded the case of Zubic v. Burwell back to the lower courts. It was an unusual move by the high court to punt this case. In a highly unusual move, the Supreme Court passed off the case of Zubic v. Burwell like a hot potato. It passed the case to the lower federal appeals courts. The high court, short by one justice due to the death of Antonin Scalia, was unwilling to address head-on the issues on the merits raised by the Little Sisters of the Poor and other religious organizations. In fact, the opinion states that no determination is being made about whether the Religious Freedom Restoration Act is violated by Obamacare regulations which refuse to exempt certain religious entities from providing their employees with mandated contraceptives and abortion-inducing drugs. And so, what is lost and what is gained by the court exercising judicial restraint in this matter? What is lost, or at least postponed, is a high court pronouncement on behalf of religious liberty. The five-page opinion refuses to address the religious liberty issue for the Little Sisters and the other religious groups joined in the suit. That is a shame because the language of the Religious Freedom Restoration Act is clear. The Little Sisters and their fellow religious objectors were threatened with substantial fines unless they caved in to the government’s demand that they sign a form that would make them complicit in furnishing their employees contraceptives, thus violating their religious convictions. An opinion similar to the one issued in the Hobby Lobby and Conestoga Wood Specialties cases would have confirmed the court’s willingness to protect religious organizations, companies, schools, and other entities from mandates that infringe upon their faith commitments. However, with the court at only eight members, a four-four tie would have been inconclusive. It would have had the effect of affirming various appeals-court decisions which varied depending on the circuit. However, the court’s decision does produce some clear benefits. Among them, the opinion seems to recognize that the government has already conceded it does not need the Health and Human Services form signed by the Little Sisters and others in order to comply with the Obamacare regulations. The court says that the government is already effectively on notice that the Little Sisters and the other complainants view the mandate as contrary to their beliefs. So, no form need be signed. Furthermore, since the signed form is not necessary, the government has no basis for fining or penalizing the Little Sisters or other parties. In turn, the Little Sisters order takes the reasonable position that if the government or an insurance company chooses to provide contraceptives, cost-free, to some of the employees of its order without making the religious order a partner to that transaction, they would have no basis for objection. What will happen now? The cases will go back to the various Federal Courts of Appeal where they originated for proceedings consistent with the Supreme Court’s opinion. Realistically, what are the choices? First, since the government has given up the requirement of participation by the Little Sisters and other litigants in the signing of a form, the cases may simply be settled. Secondly, if a settlement is not reached the appeals courts will hold hearings and render new decisions which, most likely, will not make their way to the Supreme Court until we have a new president and, in all probability, a new Supreme Court nominee. Can the Little Sisters claim a win on the basis of this opinion? In a practical sense, yes. They are not made complicit in a way that violates their religions consciences and views, and they emerge without having to pay a fine that could destroy the order.